Hatfield & Crusaders sealed the Division 5A title on the final day of the season, despite falling to a narrow defeat at St Albans II. Backed by a throng of loyal – and vocal – supporters at Clarence Park, Sam Edge took the crucial wicket that yielded the solitary point required to seal the trophy. Skipper Gareth Wynne had no hesitation in electing to field after winning the toss, and did not have long to wait before the opening partnership was broken. Sam Edge, who ultimately claimed 2/30, was ably backed up by economical spells from Aman Sofat (1/32) and Ben Clark, whose five overs cost just 11 runs. Although opener Ahmed carried his bat resolutely for 80*, Hatfield & Crusaders chipped away at the other end. The ever-reliable spin duo of Wynne (2/31) and Deepak Hasiza (3/22) restricted St Albans’ middle order, while Amit Singh (2/46) returned in style after a lengthy absence through injury. The hosts were eventually bowled out for 211, in the 50th over of the innings. With the league title secured, Hatfield & Crusaders could be forgiven for a slightly below-par performance with the bat. A probing spell from opener Charles Smith reduced Hatfield & Crusaders to 67/6, despite a belligerent counter-attack from the returning Preet Singh (19). Clark and Amit Singh dragged the side back into the contest with a 39-run partnership, before Singh fell for 26. That left the side 106/8, only halfway to the target. However, Clark had not given up hope of victory, and combined with Sofat (11) for 52 quick-fire runs. Clark batted with increasing fluency, striking nine boundaries in total and running well between the wickets, before Wynne was adjudged LBW. Clark was left stranded on 61* - his maiden first team half-century – as Hatfield & Crusaders fell 32 runs short. After finishing 14 points clear of Watford Town II at the top of the league, inspirational captain Gareth Wynne was quick to praise the efforts of his squad throughout the season. He highlighted the side’s commitment and determination despite a number of injuries and absences in the latter half of the year. Particularly noteworthy performances were produced by Amit Singh (515 runs at 57.22, including five fifties), youngsters Sam Edge (212 runs at 42.4 and 21 wickets at 22.62) and Ben Clark (19 wickets at 19.84), all led by the irrepressible Wynne (25 wickets at 11.2). Hatfield & Crusaders Division 5A campaign reached a thrilling denouement in the penultimate game of the season. Playing host to relegation-threatened Bentley Heath, Hatfield & Crusaders required one win from the final two fixtures to seal a hard-fought promotion. After the visitors won the toss and elected to bat, Ian Golder produced a magnificent spell with the new ball, taking three wickets for just 18 runs in a 10 unchanged overs which included four maidens. Bowling a consistently full length, Golder unerringly attacked the stumps and gave Hatfield & Crusaders the upper hand in the early stages. Aman Sofat (2/36) provided excellent support, and claimed two crucial wickets, including captain Hubbard for a quick-fire 36. Bentley Heath recovered from a rocky position of 55/5 to reach 103/5 before a rain shower interrupted proceedings. Hatfield & Crusaders regrouped well after the resumption, and three quick wickets looked to have swung the game decisively their way. Skipper Gareth Wynne (2/27) bowled a characteristically miserly spell, trapping two batsmen in front, before Sam Edge emphatically threw the stumps down to leave Bentley Heath 119/8 with overs running out. Undaunted, Mohammad unfurled a flurry of powerful strokes to drag his side to a respectable total. Capitalising on an extraordinary sequence of dropped chances by Hatfield & Crusaders, he struck 12 fours to go with a pair of sixes to finish unbeaten on 80, as Bentley Heath closed on 196/8 from 46 overs. Hatfield & Crusaders started well in response, reaching 37 without loss in the 11th over before Francis had Yugal Kalaskar caught behind for 11. Heath Bond continued to bat fluently, finding the boundary with regularity in a stand worth 68 with Mark Collins (20). Bond struck the ball powerfully, clearing the ropes three times in an innings that also included six fours, before being bowled for an impressive 64. However his dismissal prompted a collapse, as Hatfield & Crusaders slipped from a dominant position of 105/1 to 108/4. Deepak Hasiza stemmed the flow of wickets with a determined knock, combining deft deflections with well-judged aggression to punish any loose deliveries, before he was castled by the returning Francis for 39. With the match on the line, Francis bowled an excellent spell to claim 4/25 and leave Hatfield & Crusaders teetering on 172/9. In the gathering gloom, the last pair required an unlikely 21 from the final two overs. With nerves jangling on the sideline, Sofat opened his shoulders and struck three powerful boundaries to restore some hope. When he took a single in the final over, leaving three runs from the final two deliveries, the chance to be the hero fell to captain and long-standing club legend Gareth Wynne. And he delivered in style, unveiling a flamboyant pull shot – not seen since about 1982 - in the near-total darkness to dispatch the ball to the fence. Hatfield & Crusaders sealed the win with one wicket and just one ball to spare in the tensest climax imaginable, as Sofat (18*) and Wynne (6*) added a priceless 26 runs for the final wicket. With promotion in the bag, the side travel to St Albans II next week requiring one more point to clinch the league title and secure a spot in Division 4A next season. The 2nds fell to a narrow defeat away to Old Elizabethans II. Ben Pulham starred with the bat, making an impressive 56, and was supported well by Yasir Shafi (25) and Andy Foster (24). Although Hatfield & Crusaders produced a determined bowling performance – including 3/22 from Shafi, 2/39 from Asif Ghafoor, 1/41 from Foster and an economical 1/17 from Tony Jakes – Old Elizabethans reached their target with two wickets in hand. A pleasing season for the 3rds ended in a disappointing defeat at Stevenage V, who were victorious by a margin of 116 runs. Hatfield & Crusaders slipped to an emphatic defeat at Holtwhites Trinibis II, just the third of the season, as their lead at the top of Division 5A was halved. Having lost a crucial toss and been inserted by the hosts on a tricky pitch, Hatfield & Crusaders struggled to adapt to conditions. An excellent bowling display from Holtwhites saw Hatfield & Crusaders collapse from 29/2 to 32/6. Only Sam Edge provided any real resistance with the bat. He contributed a defiant 28 to drag the team to a below-par total of 88 all out. That effort was never likely to threaten promotion-chasing Holtwhites, who reached their target in the 25th over, with 7 wickets to spare. Hatfield & Crusaders proved more resilient in the field, and fought hard for three bonus points as Edge, Aman Sofat and Deepak Hasiza claimed a wicket apiece. With just two games remaining, Hatfield & Crusaders still occupy top spot. With a lead of 29 points, one win from the final two fixtures will be enough to secure promotion. There was similar disappointment for the other sides, as the 2nds succumbed by 125 runs at home to Boxmoor, and the 3rds were defeated by 4 wickets by Hoddesdon IV. Hatfield & Crusaders defied a heavy rain shower to seal a 12th victory of the season, triumphing over London Colney by 19 runs at Ascots Lane. The visitors won the toss and asked Hatfield & Crusaders to bat first. Despite the early loss of opener Yugal Kalaskar, Heath Bond (34) and Kunal Shah rebuilt in style, with a fluent partnership worth 86 runs in just 18 overs. Both batsmen were quick to latch onto any loose deliveries, and found the boundary with regularity. London Colney fought back well with disciplined spells of medium pace and spin bowling, and slowed down the run rate with the wicket of Bond. Shah continued serenely, with the support of Lewis Wynne (24), before he was bowled for a well-compiled 57. It was left to Deepak Hasiza (21*) and Rory Gethin-Golder (12) to accelerate in the latter stages of the innings. They combined for 40 runs from the final 6 overs to see Hatfield & Crusaders to a competitive score of 212/7. Hatfield & Crusaders struck early with the ball, as Gethin-Golder (2/55) broke the opening partnership in just his second over. Ben Clark also kept things tight at the other end, and claimed a sharp catch in his follow through to remove the other opener. The seamers were backed up well by Aman Sofat (1/27), who was hit for just two boundaries in the entirety of his spell to keep London Colney behind the asking rate. At 78/5 and 123/7, London Colney's chase looked to be faltering. However, some defiant lower-order partnerships ensured a close finish. Spinners Deepak Hasiza (1/24) and Gareth Wynne (2/36) bowled with great control in spite of the slippery conditions, before Clark returned to claim the crucial wicket of Pinkham (31) with another outstanding catch off his own bowling. 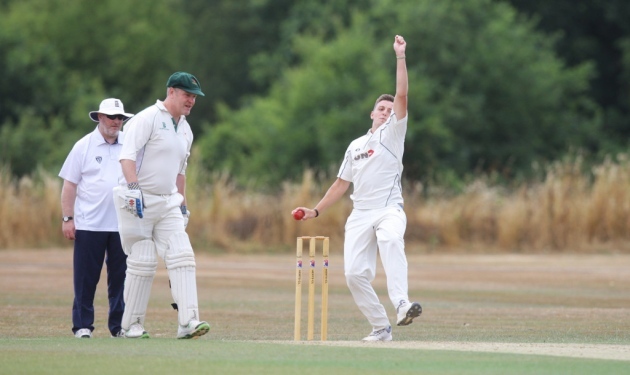 When the last wicket fell to a run out from Joe Bigley, Hatfield & Crusaders were the victors by 19 runs, and maintained a 56-point lead at the top of Division 5A, with just three matches remaining. The 2nds were narrowly on the wrong side of a game which was also rain affected. Having chosen to insert Bushey II, Alan Jakes (2/33) dismissed both openers cheaply. With Ian Golder (1/31) also bowling with characteristic economy at the other end, Hatfield & Crusaders were well on top after 20 overs. That pressure was maintained through Andy Foster (2/31), Tony Jakes (2/49) and Aaron Foster (2/25). Bushey produced a resilient innings from the middle and lower order, however, and ultimately were bowled out for 226 in the 49th over. Despite the loss of an early wicket, Hatfield & Crusaders bounced back with a 52-run partnership between Alex Digby (28) and Yasir Shafi (35). When both batsmen and the middle order fell in quick succession, Hatfield & Crusaders were struggling at 95/6. Undaunted by this situation, Ben Pulham (30*) and Golder (17*) recovered well, and reached 156/6, with just over a run a ball required from the final 11 overs. With the boundaries starting to come more frequently, Hatfield & Crusaders were unlucky to be thwarted by a heavy shower which brought the game to a premature conclusion, resulting in a rain-affected defeat. Hatfield & Crusaders suffered defeat for just the second time this season, succumbing to a competitive Waltham X Rosedale side by 5 wickets. Despite this result, which ended the club's winning streak at 6 games, Hatfield & Crusaders remain 47 points clear at the top of Division 5A. After returning skipper Gareth Wynne called correctly at the toss and elected to bat, Hatfield & Crusaders were tied down well by some accurate bowling from the Waltham X openers. The usually dependable top order fell early to leave the side struggling at 33/3. Despite determined innings from Anil Madduri (21) and Lewis Wynne (23), the batsmen struggled to adapt to a pitch which provided some assistance to the bowlers. After both batsmen fell in quick succession, Ian Golder (18) and Ben Clark (16) dragged the side towards a respectable total. When the latter fell to end a last-wicket partnership worth 25, Hatfield & Crusaders were all out for 127, a total which seemed some way below par. Golder continued his excellent recent form with the ball, claiming 1/8 from an opening spell of 7 overs, which included 5 maidens. That early strike heralded the arrival of Barry (67) who broke the back of the chase with a flurry of powerful strokes. Although he eventually fell to Gareth Wynne (3/18) to prompt a late wobble, the hosts reached their target with more than 20 overs to spare. Hatfield & Crusaders will look to bounce back next week, as they host London Colney. The 2nds enjoyed a thrilling contest against Bovingdon, at Ascots Lane. The visitors won the toss, and made 177 all out, setting Hatfield & Crusaders a daunting total to win. Hatfield & Crusaders struck early through Alan Jakes, who took 2/6 from a remarkable 10-over spell which included no fewer than 8 maidens. The Bovingdon innings was underpinned by a determined 71 from Buttleman, as no other batsman reached 20. Jakes was well supported by brother Tony (2/51), Yasir Shafi (1/43) and Aaron Foster, who claimed 4/47 to peg back Bovingdon's lower order. Bovingdon started well with the ball, as both openers fell with 10 runs on the board. Hatfield & Crusaders re-built well from there, as Shafi (32) and Joe Bigley (19) combined for a fluent partnership to get the chase back on track. After this partnership was broken, however, wickets continued to fall regularly and Hatfield & Crusaders were struggling at 91/6 at the halfway stage. Andy Foster (24) struck five boundaries in quick succession to wrest the momentum back in favour of the home side, before being smartly caught with 41 runs still required. With the pressure mounting, captain Tony Jakes produced a calm and sensible innings to inch the side towards the target. Although Aaron Foster (13) was caught behind with the score on 168, leaving 10 runs for the last pair, Jakes (19*) struck three emphatic boundaries in an over to see the team home and clinch a hard-fought victory by one wicket. This result sees Hatfield & Crusaders move up to 5th spot in Division 6B, and cement their position for next season. The 3rds secured a thrilling win of their own, as they defeated St Margaretsbury III by two wickets. A fine collective bowling performance saw St Margaretsbury dismissed for 143 in the 37th over. Wickets were shared throughout the attack, with stand-out performances from Syam Chowdary (whose 6 overs yielded two wickets for just 8 runs), Rory Faraday (3/35) and Clive Starr (2/20). There was also a wicket apiece for Nilesh Vaghadia (1/27) and Ravi Lavu (1/32). Hatfield & Crusaders looked to be cruising in reply, reaching 106/2 after 25 overs. This excellent start was led by skipper Leigh Parkhouse (33) and Don Purohit (31), before the loss of 4 wickets for 9 runs brought St Margaretsbury back into the contest. Some lusty blows from Starr (19*) ultimately saw the side home, with 2 wickets and 5 overs to spare. Hatfield & Crusaders maintained a tight grip on top spot of Division 5A by securing an 11th win of the season, in a thrilling contest with Hertford III at Ascots Lane. Having lost the toss and been asked to field in extremely blustery conditions, Hatfield & Crusaders struck first through Rory Gethin-Golder (2/22), who claimed two wickets in an over to reduce Hertford to 24/2. Gethin-Golder, who claimed a sharp return catch in his follow-through, combined with Sam Edge (0/40) in impressive opening spells which kept the run rate in check in the early stages. Despite some costly lapses in the field, Hatfield & Crusaders continued to take wickets at regular intervals through stand-in skipper Deepak Hasiza (1/24) and Ben Clark (3/28), who attacked the stumps frequently in a disciplined and probing spell. At 57/5 after 20 overs, Hertford were struggling to reach a competitive total. However two resolute partnerships saw Riddle (41), Hurrell (54*) and Codd (35*) rebuild well, and close Hertford's innings on 186/6 from their 50 overs. Extras proved particularly costly for the hosts, as the bowlers struggled for accuracy. Hatfield & Crusaders got off to a flyer in reply, with openers Yugal Kalaskar (36) and Heath Bond (18) racing to a 50-run partnership in just the seventh over, with a flurry of boundaries. Although Bond perished after picking out mid-on, Kunal Shah (45) ensured there was no let-up with some powerful drives of his own, with Hatfield & Crusaders looking well placed for a comfortable win. Hertford fought back again to chip away at the middle order, led by a strong spell by left-arm spinner Osbourne (2/29). The bowlers were backed up well in the field as several batsmen were caught in the circle, having succumbed to aggressive shots. Shah reined in his own natural game to anchor the run chase, but when he too holed out Hatfield & Crusaders were struggling at 158/7. After two further quick wickets, the last pair united at the crease with 19 runs still required. If there was pressure at the death, it didn't show for 16-year-old Edge, who batted with admirable maturity in making 22*, without taking unnecessary risks. At the other end Gethin-Golder (11*) bided his time before striking a four and a six in the space of three balls to seal a topsy-turvy contest with one wicket to spare. Hatfield & Crusaders travel to Waltham X Rosedale next week, with their 52-point lead intact. The 2nds also won a close game, with a 19-run victory at Allenburys & County Hall II. Having won the toss and elected to bat, Hatfield & Crusaders made an excellent start through openers Mark Collins (32) and Lewis Wynne (33), who put on 71 for the first wicket. Allenburys dominated the middle overs, reducing Hatfield to 132/7, and a score which looked to be some way below par. However Ian Golder (80*) produced a stunning display of hitting to haul the side to a 222/9 from their allotted overs. Golder combined for partnerships worth 39 with Andy Foster (13) and 40 with Alan Jakes, the latter of which took just two overs, striking 8 fours and 4 sixes in a remarkable innings. Allenburys batted well and looked set to overhaul their target before a sublime catch in the deep from Collins claimed the crucial wicket of Dawson for 61. Skipper Tony Jakes (4/46), Foster (1/45) and Yasir Shafi (1/47) each took wickets, as the hosts were ultimately dismissed for 203 in the final over. Hatfield & Crusaders move up to 6th in the table, after a hard-fought victory. The 3rds claimed a comfortable win over Knebworth Park IV, to return to winning ways. Asif Ghafoor (34) got the innings off to a solid start in tandem with Keyur Mistry (14), before the side faltered a little to be 73/6 at the halfway stage. Rory Faraday (34) and Max Oram (54) salvaged the situation in style, combining for a 113-run partnership that underpinned an imposing total of 199/8. he 4ths lost narrowly for the second week in succession, to Rickmansworth IV. Rickmansworth were bowled out for 99, with Nilesh Vaghadia (3/10) and Hari Rathakrishnan (3/26) impressing. Hatfield & Crusaders were eventually bowled out for 89 in reply, falling agonisingly short. Hatfield & Crusaders extended their lead at the top of Division 5A to 52 points after sealing a hard-fought win over Watford Town II, at Ascots Lane. Seeking to take full advantage of a true wicket and a lightning outfield, stand-in skipper Deepak Hasiza had no hesitation in electing to bat after winning the toss. Despite losing an early wicket, Hatfield & Crusaders re-built through the in-form Yugal Kalaskar (19) and a fluent innings from Kunal Shah (38), who found the boundary with regularity. After Kalaskar was caught in the cordon to a delivery with some extra bounce and Shah perished trying to hit over the top, Hatfield & Crusaders had reached 100 for the loss of three wickets at the halfway stage. Although Amit Singh produced another determined innings in compiling a patient 42, his dismissal heralded something of a collapse as the side slipped from 130/4 to 178 all out due to probing spells of spin bowling. Matt Jennings (24) and Preet Singh (22) combined for a quick-fire partnership worth 25 to steady the ship, but could not prevent a below-par total. Watford Town II started aggressively, with a flurry of boundaries, before the impressive openers Ben Clark (1/37) and Sam Edge (3/29) made crucial early breakthroughs to stem the run rate. Watford Town initially recovered well, with all middle order players making starts to keep them in the contest. However, a persistent bowling attack claimed wickets at regular intervals to ensure that Hatfield & Crusaders remained in control of the game. Preet Singh (1/19), Aman Sofat (3/25) and Hasiza (1/25) all bowled economical spells to build the pressure on their resolute opponents. The Watford Town skipper stood firm in an attempt to take the game to the closing overs, before he was bowled by the returning Edge to confirm a 10th win of the season for Hatfield & Crusaders. The side next hosts Hertford III, who have built up a head of steam with four consecutive victories of their own. The 2nds fell to an 84-run defeat in a high-scoring game at Hemel Hempstead III. Hatfield & Crusaders struck early as threatening spells from Rory Gethin-Golder (1/29), Ian Golder (2/56) and Alan Jakes (1/28) reduced Hemel Hempstead to 40/4. The hosts fought back strongly, as captain Graham Clark (108*) and Sunny Kullar (90) combined for a match-winning partnership. Tony Jakes (1/23) finally broke this stand, but Hemel reached an imposing target of 252/5 from their 50 overs. Hatfield & Crusaders made a promising start through Yasir Shafi (37) and Aaron Foster (34), reaching 84/2 after 15 overs. However wickets fell regularly in the middle overs, and the side were eventually bowled out for 168 in the 35th over. The 3rds slipped to a narrow defeat, away to Hitchin IV. Hatfield & Crusaders posted 126 all out, with notable contributions from Rory Faraday (29), skipper Leigh Parkhouse (27) and Colin Jennings (20). Hitchin reached their target with three wickets and 10 overs in hand. The 4ths fell agonisingly short of a victory in a friendly at local rivals Hatfield Hyde. Fielding first, Hatfield & Crusaders struck early through new ball pair Clive Starr (3/22) and Alan Dudman (2/15). Davies contributed almost half of Hatfield Hyde's runs, making 71, before he was eventually dismissed by the returning Starr. Colin Jeffery claimed 3/24, as the hosts were bowled out for 155. Starr (22) got Hatfield & Crusaders off to a flier in reply with some powerful strokes. His innings was backed up well by Dileep Patel (31) and Luke Jeffery (50*) who looked to have set Hatfield on course for the victory. However, a fightback from Hatfield Hyde claimed a number of late wickets, leaving Hatfield & Crusaders stranded 6 runs short of their target at the end of their 40 overs. Hatfield & Crusaders continued their excellent run of form in Division 5A with a comfortable win at Ickleford II. After the hosts elected to bat first on another sweltering Saturday, Rory Gethin-Golder (1/48) made an early breakthrough in his first over. He was backed up well by Sam Edge (2/47) and Ben Clark (3/33), who bowled impressively to reduce a youthful Ickleford side to 52/4 in the 12th over. Clark showed unrelenting discipline in a probing spell, claiming a sharp catch off his own bowling and the key wicket of Jenner, who made played fluently before falling LBW for 28. Although a defiant 107-run partnership between Crouch (52) and Jiggle (41) threatened to take the game away from Hatfield & Crusaders, stand-in skipper Deepak Hasiza (1/30) claimed a crucial wicket to check the batting side's momentum. Wickets continued to fall regularly to Amit Singh (2/22) – who also took a fine, running catch – and Edge, as Ickleford reached a competitive score of 226 in the final over. Despite the loss of two early wickets in reply, Anil Madduri (61) and Amit Singh (74*) batted with great fluency to take Hatfield & Crusaders to 134/2 after 18 overs. Both batsmen took full advantage of the lightning-quick outfield with a flurry of boundaries, combining for an 82-run partnership. Madduri produced a very stylish knock, before falling to a catch in the infield. Although this breakthrough heralded a couple of quick wickets and a glimmer of hope for the hosts, Singh batted serenely to register his fifth half-century of the season. After a blistering start saw him strike two sixes and five fours in his first 35 runs, he played a mature and calm innings thereafter to ensure victory was achieved. Edge continued his outstanding all-round display with a powerful innings of his own, racing to 45* in just eight overs at the crease, hitting nine boundaries in the process. Hatfield & Crusaders' five-wicket win – with almost 19 overs remaining – sees the team extend their lead at the top of the league, which now stands at 36 points. For the second week in succession the 2nds fell agonisingly short in a run chase, at Ascots Lane. Visitors Letchworth Garden City III won the toss and unsurprisingly elected to bat. After a strong start from the batsmen, which saw three of the top four reach 30 and lay an imposing platform of 140/2, Hatfield & Crusaders fought back well to limit Letchworth to 210/9 from their 50 overs. Wickets were shared between the impressive Yasir Shafi (4/61), Asif Ghafoor (2/25), Ian Golder (1/35) and Tony Jakes (1/42). Despite the loss of a couple of early wickets in reply, Hatfield & Crusaders re-built well through Shafi (24) and Keven Whitehead (51). However a persistent Letchworth attack took wickets regularly in the middle overs to leave Hatfield struggling at 139/7, with a further 72 runs still required. Some lower-order resistance from Andy Foster (27) and Tony Jakes (15*) looked to have given Hatfield an unlikely victory, before Piper (3/38) claimed the final wicket to dismiss Hatfield & Crusaders for 204 in the 44th over, 6 runs shy. The side will seek to bounce back away to Hemel Hempstead III next week. The 3rds also suffered defeat in a close contest, at home to Old Owens III. Skipper Leigh Parkhouse made a fluent 33, before his dismissal precipitated a collapse from 52/2 to 77 all out, in 23 overs. An excellent bowling performance, including 4/15 from Syam Chowdary and 3/11 from Clive Starr, reduced Old Owens to 58/7 and made an unlikely victory seem possible. However, the eighth wicket pair dug in, and saw Old Owens to their target with three wickets remaining. Hatfield & Crusaders continued their impressive run of form with a comfortable win over bottom-club Preston II at Ascots Lane. The 94-run triumph, which keeps the side clear at the top of Division 5A, was underpinned by a spectacular hundred from popular club man Yugal Kalaskar. After stand-in skipper Heath Bond won a priceless toss in searing conditions, Preston II struck early to leave Hatfield & Crusaders 22/2 at the 10-over mark. Gallimore completed seven maidens in a remarkable opening spell that yielded only 4 runs from 10 overs. However, those early breakthroughs paved the way for a match-defining partnership from Kalaskar and Amit Singh, who took full advantage of a benign pitch and a lightning-fast outfield. Singh maintained his excellent run of form, reaching a fourth league half-century of an extraordinary season. This innings included 11 boundaries before he was eventually bowled for a brisk 67 in the 36th over. On this occasion, though, the star of the show was at the other end, as Kalaskar defied the exhausting conditions to register a superb century, his first for the club. Ruthless in punishing any short or wide deliveries, Kalaskar struck 19 boundaries in all, before succumbing to the heat and being forced to retire on 116. Hatfield & Crusaders added a late flurry against a flagging attack, to reach a competitive total of 261/5 from their 50 overs. Deepak Hasiza and Sam Edge added 14* and 16* respectively to keep up the scoring rate in the death overs. Edge resumed in style with the ball, claiming an early scalp in an economical spell of 1/18 from his 10 overs. Crucial breakthroughs followed from Amit Singh (4/26) and Preet Singh (1/37), including the wicket of top-scorer Rehman for 41.
haracteristically miserly spells from spinners Hasiza (2/24) and Andy Foster (2/17) maintained the pressure in the middle overs, as Preston's middle order could not sustain the required scoring rate. After Amit Singh return to claim the final two wickets in a fine all-round display, Preston II were eventually dismissed for 167 in the final over of the innings. The 2nds fell to a narrow defeat, after another close contest at Abbots Langley II. Played in similarly exhausting conditions, a depleted Hatfield & Crusaders side did well to restrict Abbots Langley to 235 from their 50 overs. Opener Alan Jakes was the pick of bowlers, beating the bat with regularity in a fine spell of 2/23 in 10 unchanged overs. Although he was ably supported by Hari Rathakrishnan (2/68), Asif Ghafoor (1/44) and Tony Jakes (2/42), Carlisle (112) made an indefatigable and near chanceless century to see his side to an impressive score. Hatfield & Crusaders made a good fist of the reply, with all of the top order making starts in a determined display, before Keven Whitehead (35) and Matt Jennings (78) combined for an 80-run partnership for the 4th wicket. The visitors had reached 157/3 in the 32nd over to appear strong favourites at that stage. However, both batsmen fell in quick succession to Abbots' captain Rossiter (5/39), to leave the middle and lower order plenty of work to do. Defiant knocks under pressure from Amit Shamal (32*) and Alan Jakes (23), who added a quick-fire 42 for the 8th wicket, looked to have swung the balance in Hatfield & Crusaders' favour once more, before Gurney (3/45) returned to claim the final two wickets. Hatfield were eventually dismissed for 217, to finish 18 runs short. With 3rds' opponents having conceded their fixture, the 4ths hosted division-leaders Potten End II at Roe Hill. The visitors made 257/7 from their 40 overs, with wickets shared between Max Oram (2/34), Clive Starr (2/40), Nilesh Vaghadia (2/41), Syam Chowdary (1/22) and Alan Dudman (1/42). Faced with a daunting chase, Hatfield & Crusaders were bowled out for 132 in the 26th over. There was time, however, for Clive Starr to hit a string of boundaries, eight fours and a six in total, in a belligerent knock of 56. Hatfield & Crusaders returned to winning ways in an impressive all-round display at Bentley Heath. The 72-run victory also saw the side reclaim top spot in Division 5A. Skipper Gareth Wynne lost the toss, with Bentley Heath electing to field. That decision was immediately vindicated as both openers fell cheaply. Hatfield & Crusaders weathered the storm, however, and were able to rebuild through the ever-reliable Amit Singh (59), who struck his third half-century of an outstanding season. Singh's innings included seven boundaries and was ably supported by both Kunal Shah and Yasir Shafi (20), as Hatfield recovered to 136/5 in the 35th over. Hatfield & Crusaders capitalised on this strong foundation, as the middle and lower order ensured the side reached an imposing total. Anil Madduri made a characteristically fluent 42, running well between the wickets, and was accompanied by Preet Singh (34), who powered five fours and a six in a destructive innings. There were also vital contributions from Deepak Hasiza (16) and Ben Clark (15), as Hatfield & Crusaders finished on 249/9 from their 50 overs. With a daunting target to defend, Hatfield & Crusaders produced a disciplined bowling performance. 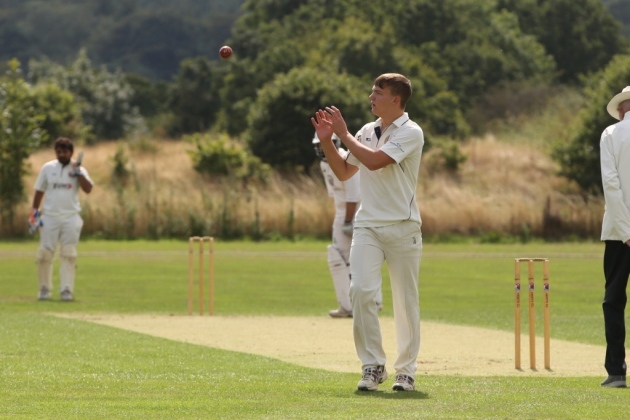 Opening bowlers Ben Clark (3/42) and Aman Sofat (1/33) maintained their good recent form, and claimed early wickets in impressive spells, as Bentley Heath were immediately put under pressure. There was no let-up, as the visitors turned to their wily spinners, who tied down the batsmen in the middle overs. Leg-spinner Hasiza bowled with remarkable accuracy in a 10-over spell which yielded 19 runs and two wickets. Skipper Wynne (4/34) was similarly effective at the other end, claiming the last four wickets to seal a comfortable win. Hatfield & Crusaders restored a 12-point lead at the top of the league ahead of the visit of promotion rivals St Albans next week. The 2nds lost in an exciting contest against Old Elizabethans II, at Ascots Lane. Mark Collins (47) took full advantage of the excellent batting conditions, hitting a string of impressive drives. Wickets fell at regular intervals, however, and Hatfield & Crusaders were struggling at 81/5 at the halfway point. Ian Golder steadied the ship with an aggressive 39, made at more than a run a ball, before succumbing to the returning opening bowler. Hatfield were dismissed for a below-par total of 163, as Richardson finished with the remarkable figures of 3/4 from seven overs. Hatfield & Crusaders fought hard in defence of that score, although some good bowling performances were undermined by a flurry of dropped chances. Golder completed a strong all-round display with an opening salvo of 1/20 from his 10 overs, including four consecutive maidens. Old Elizabethans saw off this difficult period, and were cruising to a win at 94/2 with 25 overs remaining. Andy Foster (4/37) bowled an excellent spell – including three sharp, reflex catches off his own bowling – to turn seemingly turn the game in Hatfield's favour, as four wickets fell for nine runs in seven overs. The final two wickets proved elusive, however, and Old Elizabethans reached their target with two overs to spare. The 3rds also bounced back from defeat to register an 81-run victory over Stevenage V. Hatfield & Crusaders posted a very competitive total of 186 from their 40 overs, with notable contributions from skipper Leigh Parkhouse (36), Aaron Foster (who hit three sixes in a belligerent 38) and Max Oram (34). Wickets were shared around as Stevenage struggled to compile significant partnerships against some accurate bowling. Oram (2/23) followed up his batting display in style, as Keyur Mistry (2/23) and Syam Chowdary (3/15) also claimed crucial scalps in a comfortable win. The 4ths were defeated by 6 wickets, against Markyate. The hosts chased down their target of 104 in just 18 overs, despite 17 runs from Alan Dudman and three wickets for Ravi Lavu. Hatfield & Crusaders succumbed to a first defeat of the season, losing a tight contest to an impressive Holtwhites Trinibis II side. The hosts made a strong start after skipper Gareth Wynne had elected to bat first on an excellent wicket at Ascots Lane. Openers Yugal Kalaskar (16) and Anil Madduri (24) put away any loose deliveries to race to 34 without loss in the 8th over. Both fell in quick succession, however, and it was left to Amit Singh (14) and Deepak Hasiza (22) to rebuild in the middle overs. Both batsmen were dismissed, thanks to some skilful bowling and sharp fielding respectively, and Hatfield & Crusaders were struggling at 94/6. 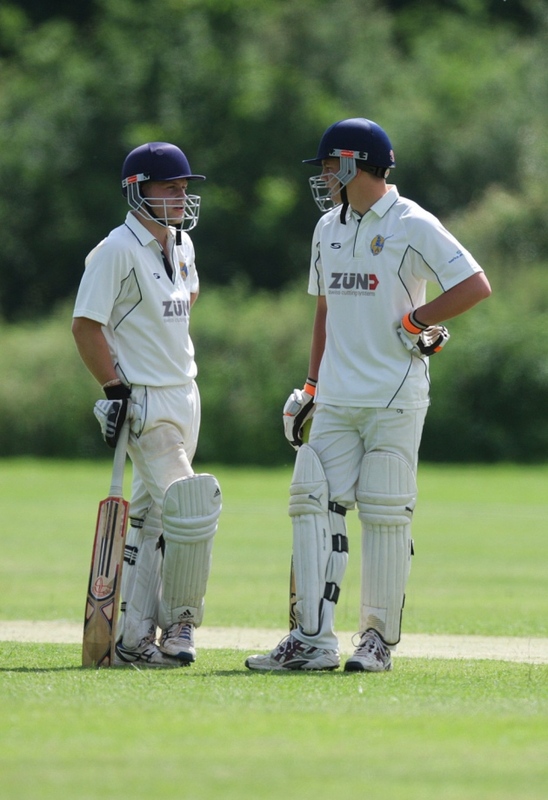 Ben Clark (20) and Sam Edge salvaged the innings with a composed 51-run partnership, calmly rotating the strike and running purposefully between the wickets. Although Clark was caught smartly to break the stand, Edge continued undeterred to register an impressive half-century. He was eventually run out for 53 – including seven boundaries - after attempting a selfless second run. A couple of lusty blows from Aman Sofat (12) saw Hatfield & Crusaders reach 188/9 from their 50 overs. Bonner and Tarling were the pick of the bowlers for Holtwhites. A disciplined start from openers Edge (0/10) and Rory Gethin-Golder (2/20), aided by a reflex catch by Preet Singh, saw Holtwhites lose early wickets and fall behind the required run rate. When opener Garnsworthy was bowled by Amit Singh (2/29) for a well-compiled 26, Holtwhites were 66/4 in the 22nd over. Sofat (1/33) also bowled an accurate spell, including three maidens in his opening salvo of seven overs. Although Hatfield & Crusaders continued to fight hard in the field, and acquired some late hope after a breakthrough by Clark (1/24), defiant innings from Tarling (51*) and Bonner (43) saw Holtwhites to their target with four wickets and just over four overs remaining. Hatfield remain in the promotion places in Division 5A, just one point behind leaders Watford Town II. The 2nds fell agonisingly short in a high-scoring contest at Boxmoor, after a determined display with a depleted side. Boxmoor posted an imposing score of 275/8 from their allotted overs, thanks in no small part to 100 from number 6 Pimm. Alan Jakes, Asif Ghafoor and Alex Digby claimed two wickets apiece. Shorn of talented all-rounder Joe Bigley with injury, Hatfield produced a great effort in response. Openers Mark Collins (28) and Ghafoor (24) combined for 68 in 13 overs to get the run chase off to the strong start required. Although the side faltered to 126/6, a succession of resolute partnerships from the lower middle order ensured a thrilling conclusion. There were many contributors, including Ian Golder (29), Hari Rathakrishnan (20), Alex Digby (31) and top-scorer Jakes (37), as Hatfield & Crusaders were eventually dismissed for 241 in the 45th over. An excellent display from Clive Starr was insufficient to prevent the 3rds being defeated by four wickets at Hoddesdon. The all-rounder contributed a belligerent 32 in a total of 126 all out, before claiming 2/21 with the ball. Economical bowling spells from Max Oram (1/24), Syam Chowdary (1/28) and Keyur Mistry (1/27) were thwarted, as Hoddesdon IV reached their target with eight overs remaining. The 1st XI maintained their excellent form, edging out London Colney in a tight encounter to extend their winning run to five matches. Skipper Gareth Wynne won the toss, and requested first use of what appeared an excellent batting track. Despite the early loss of both openers, Preet Singh (who cleared the ropes twice in a counter-attacking 45) and Kunal Shah (35) re-built steadily, combining for a 70-run partnership in 14 overs. Although London Colney made another couple of quick breakthroughs to stem the scoring rate, a patient knock from Amit Singh (35), allied to useful contributions from the lower order saw the side reach 224/9 from their 50 overs. Yugal Kalaskar and Rory Gethin-Golder both made 16, and Sam Edge finished 14 not out. London Colney performed well in pursuit of an imposing total. 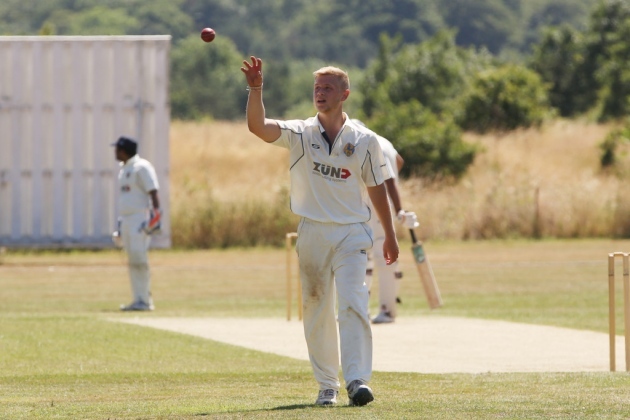 Although four out of the top five made 30 or more to put Hatfield & Crusaders under pressure, the visitors produced a determined bowling and fielding display to chip away with wickets at regular intervals. The bowlers rotated well, with wickets claimed by Gethin-Golder (2/34), Edge (1/37), Ben Clark (1/54) Amit Singh (2/26) and Preet Singh (3/32), to ensure that London Colney were bowled out for 204, falling 20 runs short. The 2nds moved up to mid-table in Division 6B, with a second consecutive win, as Bushey II visited Ascots Lane. After choosing to bat, the visitors made 151, before being bowled out in the 42nd over. The bowlers combined effectively in economical spells, and wickets were shared between Ian Golder (2), Joe Bigley (2) and Andy Foster (3). An impressive effort in the field, including three run outs, was perhaps best encapsulated by an excellent catch in the slips from Alex Digby to dismiss Bushey's best player. Golder struck an excellent 64 in response, providing the backbone to a successful run chase. With contributions from all batsmen, Hatfield & Crusaders ultimately reached their target with three wickets and 12 overs remaining. The 3rds bounced back well from defeat last week, with a comfortable 52-run win over Hertingfordbury II. Hatfield & Crusaders recovered from 52/8 to post 102, as Colin Jeffery (24) was ably supported by the lower order in two crucial partnerships to reach a competitive total. Ravi Lavu and Bikku Vamsi both added 15 runs apiece. A relentless effort with the ball ensured that Hertingfordbury were never likely to reach their target. No bowler went for more than 2 runs per over, as they all claimed valuable scalps. Openers Bikku Vamsi (5/15) and Max Oram (1/7) both bowled miserly 8-over spells, before Syam Chowdary (2/9) and Ravi Lavu (2/10) claimed the final wickets to dismiss Hertingfordbury for 54. A highly successful weekend for Hatfield & Crusaders saw the teams secure five victories from the six fixtures contested. The 1st XI extended their good run of form with a fourth consecutive win, maintaining a 15-point lead at the top of Division 5A after a hard-fought victory over Waltham Cross Rosedale. After skipper Gareth Wynne won the toss and elected to bat in sweltering conditions, Hatfield & Crusaders capitalised by reaching 50 without loss in the 16th over. Openers Heath Bond (24) and Yugal Kalaskar (20) defied disciplined opening spells before three wickets fell in quick succession. Despite composed innings from Swetang Khambhatwala (17), Ben Clark (15) and Deepak Hasiza (15) wickets fell at regular intervals, and the side were struggling at 126/9. 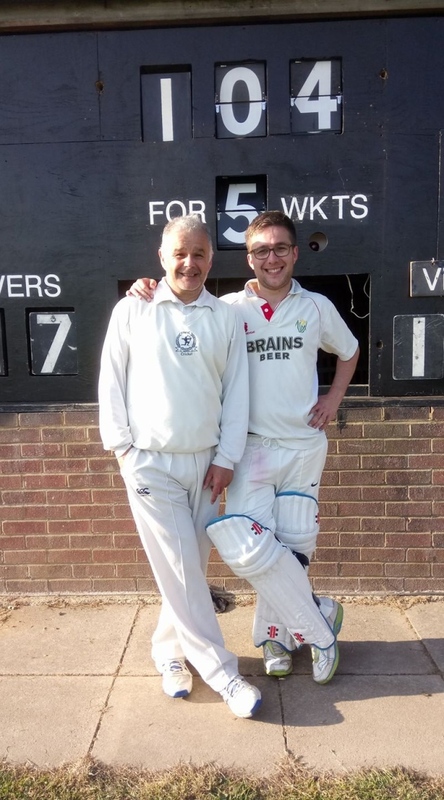 Faced with the prospect of a below-par total on a good pitch, last pair Aman Sofat (27*) and Wynne (8*) combined for a remarkable 54-run partnership for the last wicket, ensuring the side reached a competitive 180/9 from their 50 overs. The aggregate total of 51 extras, including 36 wides, played no small part. Sam Edge struck characteristically early, claiming the first wicket in his opening over. Although Waltham Cross rebuilt, reaching 40 without further alarm, the run rate was always kept in check, before a flurry of quick wickets broke the backbone of the innings. Aman Sofat (3/14) continued his outstanding match in tandem with Amit Singh (1/20) as Waltham Cross were reduced to 49/5. A spectacular, diving catch from Chandan Rao at short mid-wicket sealed the crucial wicket of top-scorer Sritharan for 20. Spin twins Hasiza (2/12) and Wynne (3/8) ensured there was no respite for the batsmen, as Hatfield & Crusaders ultimately bowled out their opponents for 92 to secure a comfortable 88-run win. An improved performance from the 2nd XI ensured a first victory of the season in Division 6B, at Bovingdon. Having been invited to field, Hatfield & Crusaders struck early through opening bowlers Ian Golder (3/25) and Joe Bigley (2/26), thanks to a couple of smart catches by wicketkeeper Keven Whitehead. Although Bovingdon were struggling at 34/5 in the 14th over, and 82/8 in the 26th, a combative half-century from Stickland (53) and a defiant last-wicket partnership saw them post 121 all out. Alan Jakes (2/23), Andy Foster (1/22) and Tony Jakes (1/6) claimed the remaining wickets, including an excellent running catch from the agile Golder. Hatfield made a swift start in response, reaching 50 without loss in the 10th over, before Matt Jennings departed for a streaky 38. Barry Phillips produced a typically resolute innings, contributing 36 including a huge six over long-on. Notwithstanding a brief wobble with 20 runs required, the target was ultimately reached with five wickets and more than 19 overs remaining. The 3rd XI suffered defeat for the first time this season, succumbing to St Margaretsbury III by 89 runs. After an opening partnership worth 88 for St Margaretsbury, a determined fielding display saw Hatfield claim the final 10 wickets for 67 runs. Wickets were shared between Syam Chowdary (4/20), Abhishek Mankar (2/33), Asif Ghafoor (2/22) and Chandan Mahanthesh (2/27). That was not replicated with the bat, however, as the side were bowled out for 66. Conversely, the 4th XI won for the first time this year, after successfully defending 97 against Northwood IV at Roe Hill. Remarkably miserly bowling spells from Ravi Lavu (3/9), Raj Jakkappagol (1/12) and Nilesh Vaghadia (1/3), each of eight overs, saw Northwood fall 13 runs short, reaching 84/9. Impressive performances continued into a T20 double header on Sunday. Hatfield & Crusaders hosted a strong Stevenage side at Ascots Lane, and ultimately triumphed in a thrilling contest. Stevenage won the toss and posted 153 from their 20 overs, with half-centuries from Mahmood (51) and Davies (59*). An excellent fielding display, epitomised by a direct hit run out by Rory Gethin-Golder, supported the bowlers well as wickets were shared between Ian Golder (1/27), Sam Edge (1/32), Ben Clark (1/37) and Alan Jakes (1/6). Hatfield & Crusaders made a strong start in response to a demanding total, as Heath Bond struck 9 boundaries in a belligerent half-century. After he fell for a quick-fire 55 – made from just 39 deliveries – the side were 90/4, with a further 64 runs required from the seven overs remaining. Sam Edge and Amit Singh were initially forced to play sensibly against some impressive bowling, leaving an imposing 44 runs needed with just 18 balls in hand. A staggering display of hitting from Singh – who struck 4 enormous sixes in making an unbeaten 46 from 22 balls – saw the side home from the final ball. It was an impeccably timed chase, as Edge added a composed 21* whilst Singh sealed the win at the death with his 12th consecutive scoring shot. Hatfield & Crusaders are the sole leaders in Herts Division 5A after a third straight win in three completed fixtures. The side defeated a competitive Hertford III side to maintain an excellent start to the season. After losing the toss for the first time this year, Hatfield & Crusaders started well in the field as Sam Edge (4/35) dismissed both openers with the new ball. Although three Hertford batsmen reached 20, disciplined bowling from Amit Singh (0/32), Deepak Hasiza (1/40) and skipper Gareth Wynne (3/24) ensured that no substantial partnerships formed and the run rate was kept in check. The team, depleted after an early injury, were determined in the field, and produced a number of smart catches. Preet Singh (2/22) claimed the final two wickets as Hertford were bowled out for 155 in the 49th over. Despite suffering an early wobble as two batsmen fell without scoring, Hatfield & Crusaders recovered thanks to two characteristically belligerent innings. Opener Heath Bond made a brisk 34, with eight powerful boundaries before being the third man out with the score on 48. He was ably supported by Amit Singh (68*), who continued his remarkable run of form with another half-century, including 10 fours and a six. Swetang Khambhatwala kept up the pressure on the bowlers with a quickfire 24 including two sixes of his own. Although two wickets fell with the finishing line in sight, Hasiza (13*) kept Singh company to see the team reach their target with four wickets and 17 overs in hand. The 2nds fared less well, as they succumbed to a six-wicket defeat to Allenburys & County Hall II at Ascots Lane. Although Joe Bigley top-scored with 31 on his return from injury, and Keven Whitehead made 25, a score of 131 all out was some way under par. 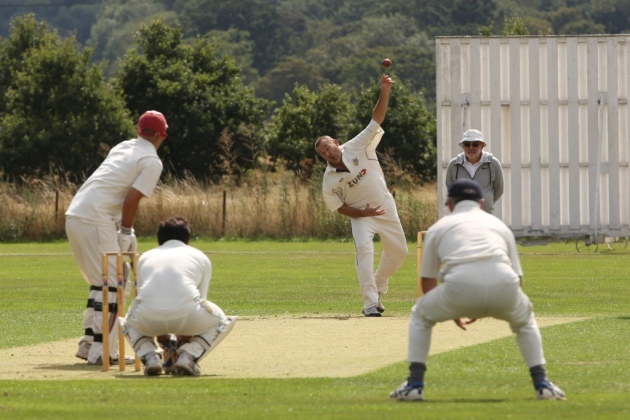 Alan Jakes claimed two wickets, but Allenburys reached their target with 13 overs remaining. The 3rds won their second game in a row, as they moved up to 2nd place in their division. An excellent team bowling performance saw the wickets shared by Max Oram (2/12), Ravi Lavu (3/17), Syam Chowdary (2/18) and Leigh Parkhouse (2/16), while the reliable Clive Starr secured three catches. Following a similar pattern to last week, Hatfield & Crusaders reached their target easily, with skipper Parkhouse top-scoring with 20 out of 86/4. The 4ths were defeated by 72 runs, at Rickmansworth IV, despite another excellent bowling performance from Nilesh Vaghadia, who claimed five wickets for the second game in a row. 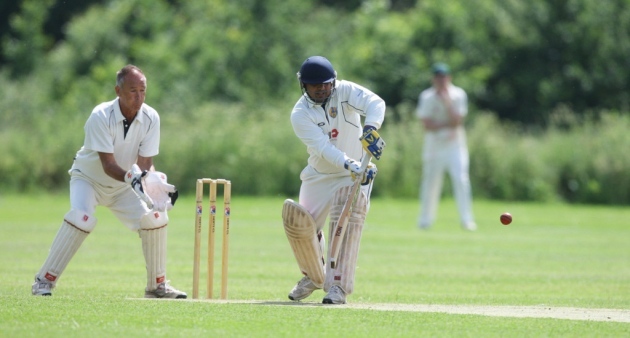 Hatfield & Crusaders maintained their strong start to the cricket season, with another impressive win over Watford Town II on Saturday taking them joint top of Division 5A. Skipper Gareth Wynne won the toss and elected to bat in glorious sunshine, in a marked contrast to last week's abandonment. The side produced an excellent team performance, with every batsman contributing at least 20 in a competitive total of 266/5 from their 50 overs. Openers Yugal Kalaskar (36) and Heath Bond (26) combined for a fluent 85-run partnership for the first wicket, before falling in quick succession. That merely heralded the arrival of the middle order, who maintained the innings' impetus. The outstanding Amit Singh (82*) provided the backbone to the innings, with able support provided by Chandan Rao (20), Preet Singh (22) and Lewis Wynne (22). Singh took the attack to the bowlers, striking 7 fours and a six in a characteristically belligerent innings which continued his impressive form. The strong collective effort continued in the field, as opening bowlers Sam Edge (2/59) and Aman Sofat prevented Watford Town from making a fast start. That pressure was maintained by Amit Singh (1/44), Deepak Hasiza (1/32) and Gareth Wynne (3/36) who claimed wickets at regular intervals to dent Watford's hopes of an unlikely run chase. A determined fielding performance, best exemplified by two superb run outs and a calm catch under pressure from Ben Clark, ensured that Hatfield & Crusaders ran out the victors by 49 runs, dismissing Watford Town II for 217 in 45 overs. The 2nds slipped to a 55-run defeat to Hemel Hempstead Town III at Ascots Lane. Hemel Hempstead batted first, and reached 229/8 from their 50 overs with some powerful late hitting, despite good spells from the returning Andy Foster (2/26), Tony Jakes (3/25) and Swetang Khambatwala (2/43). Hatfield & Crusaders made a strong start as openers Anil Madduri (38) and Barry Phillips (14) contributed 51 before the first wicket fell. However, some disciplined bowling saw the side slip to 107/5 in the 35th over, with the target looking increasing remote. Despite defiant knocks from Khambatwala (28) and Amit Shamal (39), Hatfield & Crusaders were ultimately all out for 174 in the 45th over. The 3rds won for the first time this season, securing an emphatic seven-wicket victory over Hitchin IV. Hitchin were bowled out for just 63, with Chandan Mahanthesh and Asif Ghafoor claiming three wickets apiece. Hatfield & Crusaders raced to their target in the 15th over, as Ben Pulham made 30*. Hatfield & Crusaders Cricket Club made a winning start to their Division 5A campaign, claiming a narrow win away to Preston II. Fine performances from two young all-rounders set up the victory, heralding a great deal of promise for the season to come. After the visitors won the toss and elected to field under the auspices of new captain Gareth Wynne, Sam Edge (4/38) made a flying start, dismissing each of Preston's top 4 within the first 12 overs, before the score had reached 30. Combined with economical spells from Sean Edge (0/17), Deepak Hasiza and Ben Clark (both 1/14), Preston struggled to rebuild and reached 71/8 after 30 overs. Despite the dogged resistance of Catlin (44*) and Mercer (29), Hatfield & Crusaders eventually dismissed Preston for 133, with Amit Singh (2/25) and Gareth Wynne (2/11) claiming the final wickets. The run chase was not straightforward, as Hatfield & Crusaders slipped to 25/4 in the 11th over. Lewis Wynne (18) and Hasiza (29) restored some stability, before another flurry of wickets saw the team 82/7, with another 52 runs required. With the pressure on and the result in the balance, impressively mature innings from Clark (35) and Sam Edge (15*) saw the team home with two wickets remaining. The 1s play their first home game next week, as they host Ickleford II. The 2nds succumbed to defeat to Abbots Langley II at Ascots Lane. A disciplined bowling performance saw the visitors dismissed for 130, with Ian Golder claiming 4/17 from his 10 overs, and Tony Jakes chipping in with 3/16. A flurry of early wickets left the team on 15/5, with a daunting chase in prospect. Although Barry Phillips contributed a defiant 29* from no. 3, the side ultimately fell 46 runs short, as they were bowled out for 84. The 4ths were defeated by Potten End II by 6 wickets, after the 3rds' opponents conceded their fixture. Hatfield & Crusaders Cricket Club got their competitive season off to a winning start with a comfortable 16-run victory over a strong Stevenage side in the Sunday T20 Cup. Led by the charismatic Alex Digby, an impressive team performance provided considerable encouragement for the new campaign. Hatfield & Crusaders lost the toss and were asked to bat first at Ditchmore Lane. Heath Bond defied any early season rustiness with a fluent 40 in a fast start for the visitors, who brought up their 50 in the 7th over. Stevenage fought back, claiming opener Leigh Parkhouse for a useful 15 to prompt a middle order wobble. At 74/5 with six overs remaining, Hatfield & Crusaders were some way short of a par score. However, this was to reckon without stand-out performer Amit Singh, whose 44 (made from 29 deliveries) included three sixes and propelled the side to a respectable 135/5 from their 20 overs. Spinner Davies impressed for Stevenage with 3/13 from his four overs. A disciplined start from opening bowlers Rory Gethin-Golder and Ian Golder (0/20 and 2/13 from their four-over spells respectively) saw Stevenage fall behind the required rate, and never recover. Hayward (37) provided some resistance until he was smartly caught by Gethin-Golder off the bowling of Preet Singh (2/17). Tidy spells from Deepak Hasiza (1/35) and Amit Singh (1/24), allied to some good fielding, ensured that late boundaries for Stevenage were to no avail, and Hatfield & Crusaders ran out comfortable victors.